While typing your message, select the Message tab in the Ribbon and click the arrow beside Tags. The Properties dialog box appears. 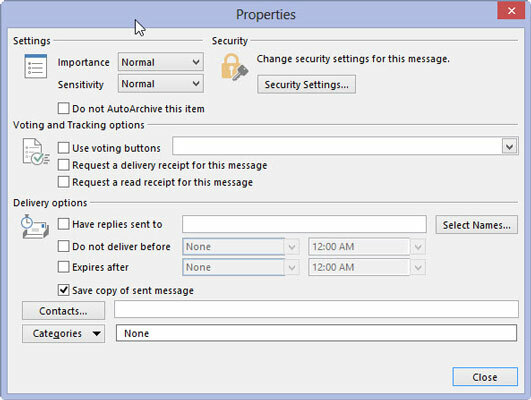 This dialog box enables you to define a number of optional qualities about your message. Click the triangle beside the Importance box. Choose Low, Normal, or High. Click the Close button (or press Esc) to close the Properties dialog box. Usually Importance is set to Normal, so you don’t have to do anything. Putting a Low importance on your own messages seems silly, but you can also assign importance to messages received in your Inbox, to tell yourself which messages can be dealt with later, if at all.